Imagine having to work in an environment where you were treated as less than a human; had to deal with extremely harsh working conditions and were unable to speak out without the risk of losing the only job you were able to get to survive. This is the reality that many factory workers have to face around the world. These workers are exploited by the factories that they work for and the companies that own or run the factories don’t regulate working conditions for many workers in developing nations. There are multiple companies that have factories that violate humane working conditions but one of the major culprits is Nike. Nike is one of the many companies that produce many of their items abroad. The outsourcing that takes place is beneficial for the company but very detrimental so the workers that work in the foreign factories. While it does provide work to those that are in need of an income, they are also underpaid, overworked, and exploited under these companies. In Nike’s case, they have sweatshops in many places including Vietnam and Pakistan where workers are not given fair rights or wages for the amount of work they are forced to do. Workers are routinely physically abused, mentally abused, and sexually harassed in these factories. Not given proper training or having the necessary safety equipment. Exposed to toxic glues and chemicals. Paid an average of $1.60 a day when at least $3.00 a day is needed to survive. Expected to work an average of 60 to 70 hours a week. While Nike publicly says that the conditions that these workers are working in are constantly regulated, they are usually only monitored a few times a year. During those times, sweatshops are made to fit working conditions and the monitors almost never speak directly to the workers; instead they speak only to the owners of the sweatshops who are usually the ones that are perpetuating the violence towards the workers. Nike does not offer these workers benefits but has agreed to pay for medical expenses only by reimbursing workers for medical bills that they have paid in full. In most cases, the workers aren’t able to afford adequate medical attention and therefore don’t receive any compensation from Nike. Workers are also often scared of those that run the sweatshops in fear that they will be abused for wanting to use the bathroom or even taking a break. They are at time restricted from using the facilities since that would lessen the amount of items that were produced. Women often wear multiple sanitary napkins or refrain from using as a result of this which leads to even more unsanitary conditions and medically dangerous conditions for the workers. Nike does not only abuse adult sweatshop workers, they are also reported to frequently hire people under the age of 18 in these sweatshops and there are no initiatives taken to monitor this. Nike signed a pledged to stop using workers in hazardous situations in 1998 after denying any abuse that these workers faced. Since then, Nike has not followed through with this agreement and routinely turns a blind eye to these sweatshops. This kind promise is something that should have been kept by a company that is sincerely trying to make sure that all of the labor that goes into their products is fair and just. Instead Nike decided to not take this issue into concern and continues to allow the unfair treatment of these workers. They constantly boast about how these factories offer jobs to those that live abroad and how this helps them afford a better life. In reality it forces them to work like slaves without adequate compensation and forces them to work in environments that are constantly exposed to abuse and unjust treatment. 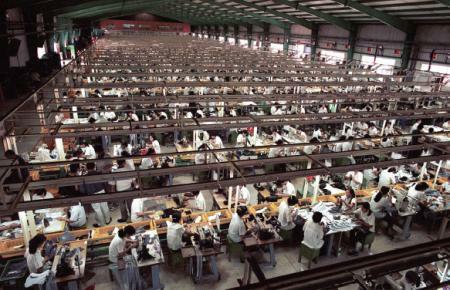 In addition to using sweatshops that perpetuate violence and offer workers inadequate conditions to work under, Nike has also bought good from manufacturers that use child labor. In Pakistan areas like Sialkot are known to use child labor to mass produce sporting goods. 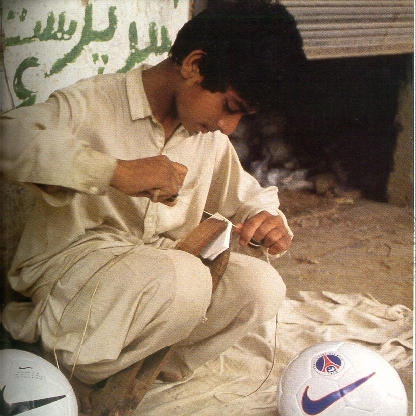 In 1996 Life magazine published an article about a 12-year-old boy in Pakistan that stitched soccer balls for Nike for about 60 cents a day. This was not uncommon for Pakistan which allowed children to work for low wages. But multi-million dollar companies using this to their advantage was something that was heavily looked down upon. This information that was leaked to the public lead to massive protest against the company from people in the United States and worldwide. Nike had purchased soccer balls from a subcontractor in Pakistan that year which showed either the lack of concern Nike had for its workers or the lack of information that the company had about what was going on. It wasn’t the latter. Nike continues to use sweatshops in countries primarily in Asia and still does not regulate these sweatshops. Their “mission” of offering jobs to those in developing nations or nations that has higher poverty rates is just a façade for saving the company money. It’s not only Nike that puts up illusion of wanting to help others. Many companies like Nike are constantly allowing sweatshops to abuse their workers and does nothing to make sure that this injustice doesn’t occur. Unlike what these companies want us to believe, they are doing nothing more than continuing repressive cycles which in result benefits them. I thought that this was very eye opening. While in high school I refused to buy/wear Nike products because of the abuse of women in sweatshops. I had not heard about their use of child labor. After I read that I was utterly disgusted. Now I am glad that I do not endorse these products. It is disheartening to hear that Nike signed a pledge to stop workers in hazardous conditions, yet neglecting to follow through. The pledge that was signed shows that the company has acknowledged how their products are made, but only care about keeping the costs at a minimum. It really is just terrible. I agree with Dana that article was very eye opening and what Nike is doing is absolutely disgusting. I actually heard about this a few weeks ago in another class and can’t believe they would treat children like this. Nike’s commercials give off the impression that are trying to empower people, especially girls, with their products. I think this shows a completely different and horrific side of Nike that many people don’t know or would ever even think of. I agree with the comments above. This article provides an eye opening view at such a popular company. The pictures that you include enhance the article and leave a lasting effect on the reader. They claim to have put a code of conduct to stop child labour and feel proud of what they did in the Kukdong factory in Mexico what are they going to do in all these other countries.